Review by AllTheBestFights.com: 2016-08-13, close and tough fight between Antonio Margarito and Ramon Alvarez: it gets three stars. Ramon Alvarez (brother of Saul ‘Canelo’ Alvarez) entered this fight with a professional boxing record of 23-4-2 (15 knockouts) and he is ranked as the No.35 super welterweight in the world. He suffered his last loss when he faced Mario Alberto Lozano in 2012, since then he has collected nine victories and one no-contest. His opponent, the former Wbo, Ibf and Wba Ww champion Antonio Margarito, has an official record of 39-8-0 (27 knockouts) and he entered as the No.74 in the same weight class. He suffered two consecutive losses between 2010 and 2011, against Manny Pacquiao and Miguel Cotto (4-stars fight, Cotto vs Margarito 2) but then he has fought just once beating Jorge Paez Jr in 2016 (=Margarito vs Paez Jr). 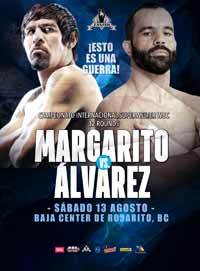 ‘Inocente’ Alvarez vs Margarito is the main event of the evening. Watch the video and rate this fight!